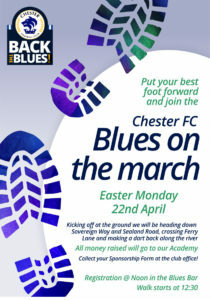 Easter Monday is set to be a big day of Fundraising at the Swansway Chester Stadium prior to Chester FC’s home fixture against Brackley. A sponsored walk will take place to raise funds for the club’s Academy. Registration will take place from noon in the Blues Bar with the walk starting at 12:30. Details are in the graphic below. Members of the Fundraising Working Group will also be selling tickets for an Easter Raffle prior to kick off with all proceeds going towards the Squadbuilder scheme as we look to provide Bern & Jonno with a war chest for next season. We have collected many great prizes including complementary pairs of adult tickets to Chester Zoo courtesy of our main sponsors MBNA. Please support these initiatives if you can. 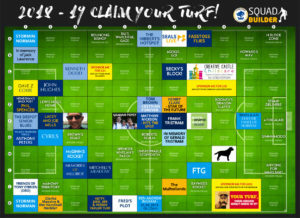 Last night (16th April), a function was held in the Blues Bar at the Swansway Chester Stadium to enable the CFU Board to give thanks to all those who had contributed to the Squadbuilder scheme either via monthly payments or through buying a “Claim Your Turf” plot. People who had taken part in these initiatives had been invited to the evening. Following an introduction from Paul Bodman, Grenville Millington gave a very entertaining talk which was full of amusing tales from his time playing for the club during the 1970s. The current first team managers, Bern & Jonno, then joined us and took part in a Q&A session. As usual, the duo were open and insightful. They felt this season had been one of consolidation, particularly as at the start of it the club was still recovering from the financial crisis. Furthermore, they joined part way through the preceding off-season therefore with more time to plan ahead this time around they are confident of stepping up a gear. All those invited were entered into a free draw for a football signed by the Chester FC squad. 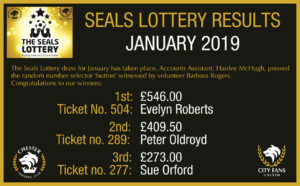 As many of these people are part of the Exiles group, it seemed appropriate that the draw was won by someone from Cardiff. At the end of the evening, the players who had been on the pitch training came in to mingle with those present while there was also the opportunity to enjoy a tour of the stadium. Paul Bodman kindly donated a framed print of the Claim Your Turf graphic for the 2018-19 season which will be hung in the Blues Bar. The CFU Board wish to thank all those involved for making the evening so enjoyable. It would be easy to believe that paying £5 each month into Squadbuilder has limited impact however the scheme is on schedule to raise over £8,000 this season. This is most impressive, especially as only around 80 people have been contributing. If more people signed up now, the managers would be able to plan ahead with a much bigger budget for next season. The club is of course grateful for all donations, particularly in recent times, but we wish to remind fans that they can continue to have a big impact on the fortunes of Chester FC for a small outlay each month. 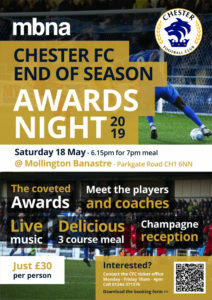 Tickets are available from the Club’s office for the End of Season Party at the Mollington Banastre on the evening of 18th May. Mingle with the stars from the playing squad while listening to live performances from Chasing Shadows – a superb local band – and enjoy a 3 course meal. All this for just £30! *Derek Williams, who won March’s second prize, sadly passed away 3 weeks ago. His widow, Dorothy, has requested that the prize be donated to Chester FC. All at the club send our condolences at this sad time and thank her for this very kind, thoughtful gesture. 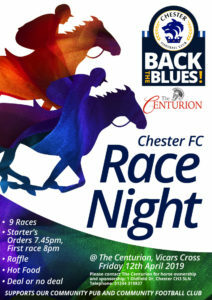 This promises to a fun night and we hope to raise lots of money for Chester FC. Please come and support if you can. 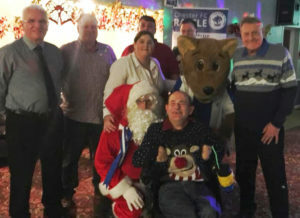 The 2018 Chester FC Christmas Raffle was drawn by club legend, Grenville Millington, on Friday, 21st December during the Chester FC Christmas Party at the Upton British Legion. Many thanks to all who bought and sold tickets. 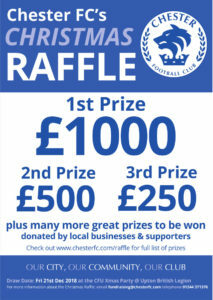 The 2018 Chester FC Christmas Raffle will be drawn on Friday, 21st December during the Chester FC Christmas Party at the Upton British Legion where club legend, Grenville Millington, will be in attendance. To be included in the draw, tickets need to be at the club by Friday afternoon. They can also be handed to The Fundraising Team at the start of the Christmas Party at the Upton British Legion on Friday, 21st December. Furthermore, you can purchase tickets right up to the day of the draw via this webpage. Tickets for the Christmas Party at Upton British Legion on 21st December, which begins at 7:30 pm, are available from the club office and also on the door on the night.